Go against the grain with this eye-catching cutting board made from end grain sections of Robinia wood. 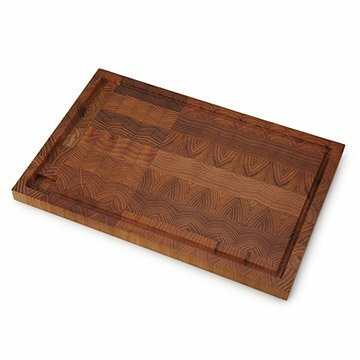 Go against the grain with this eye-catching cutting board made from end grain sections of Robinia wood. The richly stained design showcases the beauty of this durable wood with organic, repeating patterns produced by the tree's natural growth rings. Both sides of the board can be used for slicing or serving; one features a perimeter groove to catch crumbs or juices from prep for easy clean up. Made in Serbia. Hand wash. Help condition and preserve your Tree Ring Cutting Board with mineral oil. We recently gutted and completely replaced everything in our kitchen. I was looking for a large cutting board to protect my new countertops, function well, and look good too. This cutting board met all my needs and it is truly beautiful. I always wanted a large board to display cheese on and I couldn't afford some of the really beautiful boards I saw online and at craft fairs. I saw this beautiful board and it was a lot more affordable for me. I've only used it once, but I really loved it! It's perfect for a large party. And I like that it has a little grove around the perimeter to catch crumbs etc. I'm very excited to use it again. Love this product. It is beautiful and well made. We love unique and beautiful wood pieces and this fits so well in our eclectic kitchen.